The 2014 Halford Hewitt was a significant success for the OT Golf Society. The Halford Hewitt is the largest one-location golf event in the world, with over 640 players from 64 public schools competing during the week in a 10-man scratch team matchplay competition. By making the last 16 for the first time ever, Trent are now a very well-respected team, and considered a threat to any of the schools within this knockout competition. The week started with a tough draw against Marlborough School. The team fought incredibly hard, with early wins for the Bailey/Swallow and Cox/Peplow pairings. At two matches a piece, and the light fading on the first play-off hole, a fine drive from Joe Tulley and a career 5-iron to 10 feet from Ian Birch wrapped up a fantastic first round success. The galleries watching were suitably impressed with our 3-2 win. The second round against Wellingborough turned out to be a more straight-forward win. A 4-1 triumph with wins for Bailey/Swallow, Tulley/Birch, Cox/Peplow and O’Neill/Hinchley taking Trent into the unchartered territory of round three. The third round paired us with Oundle, a team with many seasoned and experienced pairings. With all but one match making it down the 18th, and with Carter / Rolfe still battling the top pair on the 20th hole, the overall match came to an end in a gallant 3.5 – 1.5 loss. It could so easily have been reversed. The week had been full of adrenaline and camaraderie, and was immensely enjoyable. Many stories had been shared about Trent’s struggles in the event over the years, memories of air shots and missed (very) short putts now a distant past, and recognising how far the team has now progressed full of excellent players. The Hewitt is played at two courses regularly voted in the top 100 courses in the world (Royal St George’s) and top 10 in the UK (Royal Cinque Ports) in East Kent in early April. We would be keen to hear from any other low single figure handicappers interested in joining the squad.. 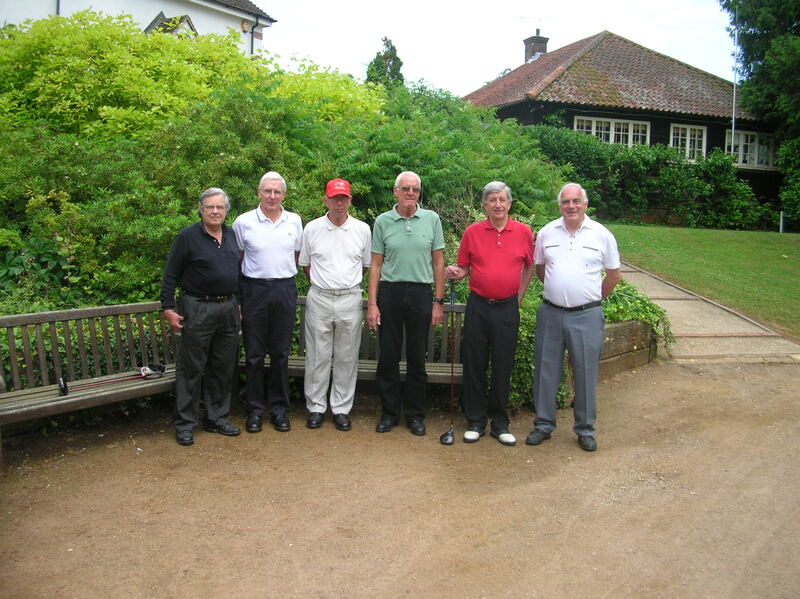 The Cyril Gray Golf Tournament was held on 27th – 29th June 2013 at its regular venue, Worplesden Golf Club, Surrey. This is a team knock-out event, 6 players per team (3 pairs), for seniors (50 and over). 32 schools take part. The 2013 Halford Hewitt was another successful year for the OTGS team. A strong squad of twelve made their way down to the East Kent coast for the annual scratch team matchplay event – a highlight of the golfing year for everyone who plays. Trent were drawn against Taunton in the first round, played on the fine links at Royal Cinque Ports GC in Deal. A gritty display throughout the team ended in an excellent 4-1 victory. Any win at the Hewitt is considered a tremendous effort. With Lancing up next in the second round, the competition went up a level, as did the strength of the wind. Despite all the team’s efforts, Lancing came out as 4-1 victors. This was the final Hewitt for Stuart Carlisle as captain, who has had excellent results and provided inspiration with his team talks and leadership over the past three years. He now passes the baton on to John Bailey, who will look to build on Stuart’s fine legacy. The Grafton Morrish Golf Competition is an annual competition played for the trophy of the same name, being the major trophy of the Public Schools Old Boys Golf Association. Unfortunately the conditions were very testing due to the wind, and despite their best endeavours in hoping to score in the region of 70 points for a good chance of qualification, the OTs missed out by just 1 point by scoring 67 points!! The Cyril Gray Golf Tournament was held on 28th – 30th June 2012 at its regular venue, Worplesden Golf Club, Surrey. This is a team knock-out event, 6 players per team (3 pairs), for seniors (50 and over). 32 schools take part. We have been competing in this event for 19 continuous years now, with more or less the same group of some 15 players. The average age of our team is around 70, and although we put up a very good performance, our age is making it difficult to compete with other teams who are able to recruit younger players. We therefore are in urgent need of new blood. On a warm and sunny Thursday 29 March, the Old Tridents Golf Society’s squad of players represented Trent College in the Halford Hewitt Golf Tournament. This prestigious tournment, held at Royal St Georges, Sandwich, Kent is reputedly the largest amateur golf tournament in the world, being a closed competition held between the old boys and girls of 64 of the finest independent schools in the UK, played using the format of Scratch foursomes in teams of five pairs. Trent played Eastbourne in the first round and were worthy winners 4 – 1, with convincing wins from Birch & Tulley, Peplow & Cox, Swallow & Carlisle and Carter & Rolfe. The second round against Harrow was always going to be a much harder match with Bailey & Coupland playing fantastically,but losing on the 18th. Three of the matches were less close, which unfortunately meant Peplow & Cox agreed to halve their match after starting to go down extra holes on the 19th giving a loss of 4.5 – 0.5. The Old Tridents Golf Society have now got an excellent squad of players, but are keen for anyone with a category 1 handicap to add additional strength to the squad. If you are interested in getting involved please contact Jo Slater, Trent College Alumni Relations office for more information. You are currently browsing the archives for the Results category.